Texas has its fair share of military bases and military servicemembers. Sometimes those servicemembers get into trouble, be it for DWI, Domestic Violence, or other criminal offenses. The military defendant, who usually has no criminal history, is not savvy with the Texas criminal justice system and must rely solely on the criminal defense attorney he selects to represent them. Below are some of the mistakes that I’ve seen when a non-military criminal defense attorney represents a military defendant. These are my opinions and should not be attributable to the United States Marine Corps or any government agency. You should not ask or allow your military criminal client to wear his service uniform to court. I understand that you may think his uniform will win him favor with the judge or the prosecutor, but it doesn’t. Anecdotally, I’ve spoken with several judges and prosecutors on this issue and it never inures to your client’s benefit. Whether you believe it or not, the general public (including judge and prosecutors) holds our military to a higher standard than the average defendant. Rightly or wrongly, they expect more from them and don’t like to see them as a criminal defendant. By allowing your client to wear his uniform, you skyline him and lower our Armed Forces in public esteem in the process. Unless it is an absolute emergency and his uniform is the only thing keeping your client from appearing in court naked, please ask him to wear the same thing your other clients wear to court. A court setting for a criminal case is the last place your client wants to be noticed in his dress uniform. When representing military servicemember, you need to ask and learn about the military consequences of the criminal case. Some criminal case dispositions trigger mandatory reporting to the member’s chain of command, which could (and often does) result in negative consequences in the military. Other types of cases (e.g. Domestic Violence) can result in your client losing the right to possess a firearm, which makes them non-deployable and virtually useless to their command. If your client does not know what his obligations are to his Service, seek out another attorney with military experience and ask them. DO NOT CALL YOUR CLIENT’S COMMAND OR THE BASE LEGAL COUNSEL. There is no privilege with base personnel and they will often be required to report your call to your client’s commander. Every servicemember has an OMPF or Official Military Personnel File. The OMPF will tell you everything you need to know about your client’s service. It will show you awards, deployments, performance ratings, disciplinary actions, and more. If you plan on using your client’s service as a positive mark in his favor, you should do your research to make sure that his service has indeed been positive. Your client may have below average ratings, several minor disciplinary infractions, and a Letters of Reprimand in his file. Or he may have combat awards, Letter of Appreciation, and early promotion recommendations. A savvy prosecutor will know all of this. The military shares information with the DA when requested. So before you drape yourself and your client in the flag, you should probably learn a little more about how “honorable” his service has been. Brandon Barnett is a criminal defense attorney in Fort Worth, Texas with Barnett Howard & Williams PLLC. He is a veteran of the US Marine Corps and Operation Iraqi Freedom. He currently serves a reserve Military Judge for special and general courts-martial. Mr. Barnett teaches Military Justice at Texas A&M University School of Law in Fort Worth. 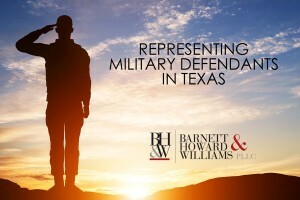 For a free consultation of your Texas criminal case or to consult with Mr. Barnett about the potential military consequences of a criminal disposition, contact him at (817) 993-9249.